J. W. Cox, born in North Carolina in 1825, it is believed that both of his parents were born in North Carolina. J. W. Cox married Sabrina Thompson who was born in Tennessee in 1825. Sabrina’s father was born in Virginia and her mother was born in Tennessee. 1850 census records indicate that the J.W. Cox family was in Cass County, Georgia. They had two daughters; Martha (1846— 1913) and Josephine (1848-c1860). Between 1850 and 1860, J. W. and Sabrina were in Marion County, Tennessee, with daughter Martha, son, John H. Cox (1852—1942), and daughter, Mary E. Cox (1853—1919). The 1860 Census shows the family in Dade County, Georgia with two sons; William P. Cox, (28July1861—2August1922) and James R. Cox, (25August1866—18May1948). Martha Cox married James Reeves. John H. Cox married Elizabeth O’Neal (m.8/18/1875). Mary E. Cox married James M. Bradford (m.2/21/1879). William Presley Cox married Sarah Catherine Bradford (24February1867-24September1922). James Robert Cox married Susan Jane Bradford (b. 10/1/1865). In 1850 in Cass County, Georgia, there was a Vincent Cox living next door to J. W. Cox and Sabrina. Vincent Cox was born in 1764 in North Carolina and was 86 years old. He could possibly be the grandfather of J. W. Cox. Military records show that John W. Cox enlisted in the Army, Company B, 5th Regiment in May 1861. He received a disability discharge April 5, 1862 in Chattanooga, Tennessee. J. W. Cox and wife Sabrina are buried in the old Methodist Church Cemetery, New Salem, Lookout Mountain, GA.
1. 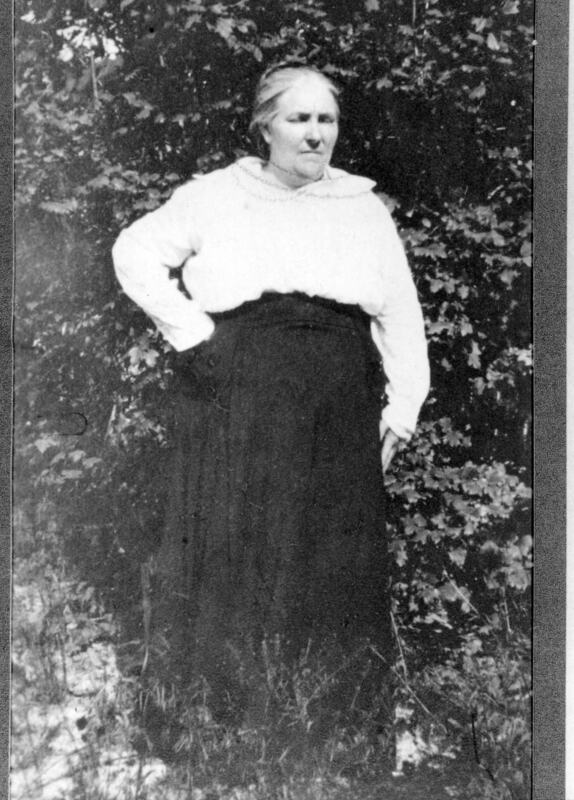 Anna May who married Claude Stancel. Their son Paul disappeared and no further information about him is known. 3. Son who was killed by a train. 8. Simon Cox – See his family. 9. Minnie Cox married Buddy Tucker. William Presley Cox married Sarah Catherine Bradford on February 21, 1886. Sarah Catherine was the daughter of William Jackson Bradford, born 12/05/1836 in Tennessee, and Nancy Warren, born 1836 in Georgia. William Jackson Bradford died May 19, 1908. Nancy Warren Bradford, born 01/15/1836 died 08/18/1923. William Presley and Sarah Catherine raised a large family. All their children were born in their first log cabin later sold to Fannie Mennen. She moved it later to the Plum Nelly site. They were large land owners. His occupation was farming and operating a blacksmith shop. Their children had to leave the mountain to attend school. Most of them went to Hiwassee School in Madisonville, TN. In 1920, they moved to Birmingham, Alabama where he was owner and operator of a drug store. He worked there until his death in 1922. Two of their daughters (Dena and Grace) are still living (as of the late 1990’s). Many of their grandchildren and great grandchildren still live on Lookout Mountain and in the surrounding areas. 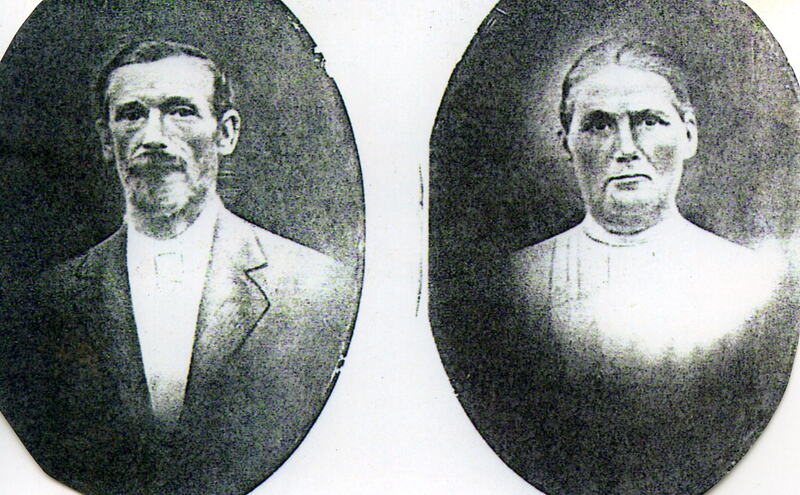 William Presley and Sarah Catherine Cox both died in Birmingham, Alabama and are buried in the Hawkins Cemetery on Lookout Mountain in the New Salem Community. They left all their land to the children living on the mountain. Much of the land is still owned by their descendants. 1. Annie Rosa Cox (1886-03/27/1967) married D. I. Jenkins (1870-1952). 2. Minnie Lou Cox (1887-1975) married Clarence Lewis Moore 3. John W. Cox (1890-1919) married a lady from Atlanta moved to Birmingham. 4. Harold Cecil Cox (11/1892- 06/13/1978) married Loraine Hartline (died 10 /1991). 5. Maude V. Cox (1897- ) married Otto Bostrom (1893- 1920) and after his death married C. N. Fuller. 6. Dena Cox (01/19/1905) married Frank McMath and later married Carl King. 7. Grace Cox (04/01/1906- ) married Allen Gray (1908-1945). 8. William O. (Bud) Cox married Clara Mudd and was later married to Pearl. Bud died 1969 in Baton Rouge, LA. 9. Howard Cox was born on 06/05/1895 and died on 01/23/1907. 10. Essie Cox was born 06/20/1899 and died on 10/01/1900. 11. Infant Cox was born 01/02/1900 and died 2/1900. Harold Cecil Cox (11/1892- 06/13/1970) married Loraine Hartline. Harold had various employments in Dade County, GA; one of which was driving a taxi. He served in World War II. He also served as Dade County Road Commissioner. Harold and Loraine divorced when their son was very young. He made his home with his sister Minnie Lou Cox Moore on Lookout Mountain, New Salem Community. He is buried in Hawkins Cemetery. Loraine Hartline Cox taught school for several years. She was employed for about 20 years as an Avon Co. representative. She died in October 1991 and is buried in Head Springs Cemetery. 1. Cecil Cox (11/26/1956-) married Peggy Daniels from Sulphur Springs, Alabama. They had one son James Presley Cox II (05/28/1978). 2. Dale Cox (09/21/1958) married Diane Rogers from Menlo, Georgia. James (Jimmy) Presley Cox and his family live on a 400 acre farm near Sulphur Springs, Alabama on the Georgia-Alabama state line. Jimmy has worked in Chattanooga for many years. He has been employed by American Thread Company, Rossville, GA for 25 years and plans are to retire soon. He also has three large chicken houses and raises layer hens. Jimmy, Joan and family are members of Sulphur Springs Baptist Church. 2. Norma Jean Proctor married Bill Coulter. They reside in Rossville, GA. Their children are Debbie and Bill, Jr.
3. Frances married Jim Rogers. Sandy is their daughter. They make their home in Rossville, Ga.
Raymond E. Cox, Jr. born 9-3-1951 to Raymond E. and Betty Bates Cox married Kathy Godfrey. Raymond is assistant principal in Ringgold, Ga. They are the parents of one son Simon McKenly (Micky) Cox. The second child of Raymond and Betty is Billie Joyce Cox born 1-2-1953. She married Steve Hayes. Billie Joyce is a R.N. Carol Ann Cox is their third child born 12-25-1957. She is in Special Education. Her husband is Randy Hixon. ”They have one son Christopher Scott. I am searching for information on the parentage of John W. Cox and Sabrina Thompson Cox. I would also like to have a better copy of the pictures on this website. Any assistance would be most appreciated and I will share information that I have found on this line. Thanks.